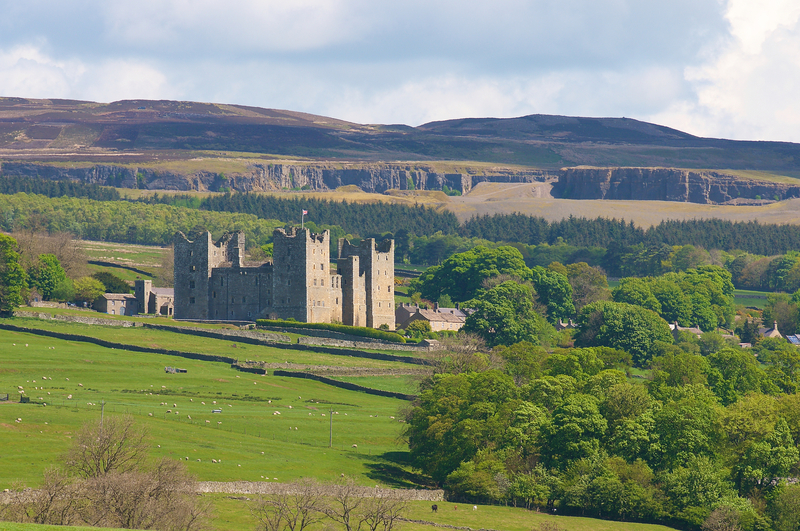 Cover image: Bolton Castle in Wensleydale, by kind permission of Anita Watson. In the last post, we followed in the footsteps of Mary, Queen of Scots, witnessing her daring flight from Borthwick Castle, Scotland, to England in 1567. Today, we time-travel to visit Mary at Bolton Castle, now the captive kinswoman of her ‘cousin’ Elizabeth. Almost 2 months to the day has passed since she arrived off the coast of Cumberland and came ashore, seeking sanctuary from Elizabeth I. Initially received as a guest, the tide was turning fast and Mary’s freedom was gradually being stripped away, even in those early days. After landing in England on 16 May 1568, the Scottish queen was held briefly at Carlisle Castle, before being spirited away further south to the relative ‘safety’ of North Yorkshire. Her destination was Bolton Castle, the ancestral home of Lord Scrope of Bolton. Mary was reluctant to travel further from her kingdom of Scotland, only doing so peaceably on assurances that she could continue her correspondence across the border. It is at Bolton Castle that we shall join her. Bolton Castle is a wonderful place to mark on your itinerary, not only because of the singularly rugged beauty of surrounding Wensleydale, but because, as a building, Bolton Castle has been noted as one of the ‘most complete and best preserved palace-fortresses of medieval England’ [Emery]; to boot, the original chambers in which Mary passed her six months at the castle are still preserved. Who could ask for more? And although the castle is now partially ruined (part of the north and west ranges were demolished after they collapsed in the eighteenth century), as a visitor, even today you will appreciate Sir Francis’ description, for it is an imposing sight; its angular lines, soaring walls and lack of elaborate, external ornamentation create an aura of foreboding. However, despite the building’s somewhat sombre personality, Bolton Castle had been constructed during the latter part of the fourteenth century as a luxurious family home, one which sported a highly innovative and complex design. The castle was quadrangular in design, with its four, tall ranges orientated around a central courtyard, linking four, massive five-storey towers in each corner. Leyland claims that it took around eighteen years to build at the astronomical annual cost of £700. Unlike the motte and bailey design of earlier castles (where there were often several different buildings arranged within an inner and outer courtyard – see the post on Framlingham Castle to understand this better), this one structure contained all the chambers, offices, stores and other lodgings required for the running of a high status family abode of the day. According to architectural historian, Anthony Emery, the internal layout was (and still is) equally remarkable. Not only does the building contain the usual great hall, chapel, kitchens and domestic offices, there are suites of chambers, halls and lodgings which have been carefully graded to underscore status, all linked together ingeniously within thick, stone walls, to connect the different levels inside one integrated building. This building would feel like a veritable rabbit warren, albeit one that had been carefully and perfectly designed to house Lord Scrope, his family, guests, officers and servants – even his horses, which were kept in stables on the ground floor! There was only one entrance to the castle, and this remains the entrance to this day. Whilst it is not particularly impressive, its very simplicity was seen as a bonus to Mary’s jailers. In a letter to William Cecil, shortly after Mary’s arrival at Bolton Castle, Sir Francis commented that ‘half the number of these soldiers may better watch and ward the same [Mary], than the whole number thereof could do at Carlisle Castle’, i.e. it was much more secure, and therefore easier to guard the Scottish Queen. Also notably, somewhere in the castle, perhaps in the courtyard as at Hampton Court Palace, there was once an astronomical clock, which Leland noted ‘marked the movements of the sun and the moon, and other predictions’. Entrance to the great hall was from the ground floor via a door in the north-east corner of the courtyard, up a flight of steps and into a small lobby which led into the low end of the hall. The hall was not particularly large. However, there was at least one remarkable feature. In the 1530s, John Leland visited Bolton Castle and was clearly given a guided tour of the house. He noted that the ‘chimneys were built into cavities in the walls between the windows, so that ‘smoke is very cleverly drawn off from the hall fireplace’ (probably a central hearth) – a kind of medieval wall vent! The high end of the hall connected through into the north-west tower and west range, which in turn linked through to the south-west tower. This range contained the principal living quarters of Lord Scrope. As befitting Mary’s status, these were surrendered for her use during the duration of her stay at Bolton Castle. Luckily for us, it is this range, and these chambers, which remain mostly intact to this day. Today, access to the rooms in the south-west tower is by a stone, spiral staircase with the principal living chamber, or solar as it is often know, on the first floor; Lady Scrope’s bedchamber on the second, and Lord Scrope’s (temporarily Mary’s) bedroom on the third floor. Whilst the rooms are identical in footprint, the last of these bedchambers has the most breath-taking views of the Wensleydale countryside. It was here that we can find Mary, gazing out from her isolated prison, hopeful that her ‘cousin’ Elizabeth would help her take back her kingdom, but also perhaps aware that the machine of the Tudor state had begun to work against her. Back on the first floor, visit the solar and an adjoining hall – one of four that were originally built into the castle walls. This was slightly smaller than Bolton Castle’s great hall, and was part of the privy residence of Lord and Lady Scrope. Today, it is known as the ‘Great Chamber’. In these living chambers, we can pause for a moment and consider how the interiors might have been furnished in the mid sixteenth century. Although a prisoner, Mary was still a queen, and her status was provided for accordingly. According to Mary’s biographer, John Guy, Mary travelled with around 30 carts, full of her own belongings. We can imagine that the bare stone walls of Bolton Castle would have been decorated with fine tapestries and carpets. We also know that whilst at Tutbury Castle, the Scottish queen kept a cloth of estate, embroidered with the words, En ma fin est mon commencement (‘In my end is my beginning’: her mother’s motto). There is no reason to believe she did not keep the same cloth of estate at Bolton Castle, perhaps in the Great Chamber, which would have acted, I presume, as a kind of presence chamber. In these rooms, Mary was attended by six gentlewomen, although Knollys suggests that none of them were ‘of reputation’ [of significance]. One of these was one of ‘The Four Marys’ who famously attended the Scottish queen: her name was Mary Seaton. Through Mary Seaton’s talents, we know a little more about the queen’s love of fashion and the visual art of queenship. In another of Knollys’ letters, we hear how Mary exclaimed to her jailers that her companion ‘was the finest busker, that is to say the finest dresser of a woman’s head of hair that is to be seen in any country’ and that they had indeed seen proof of this, with many ‘pretty devices’ set in her hair such that everyday, ‘she wore a new device of head dressing without cost’, which ‘set forth [the queen] gaily well’. It seems that revenge against those who had wronged her and stolen her throne was foremost in her mind. Typically, Mary’s time at Bolton Castle was not without drama. Elizabeth had the queen tried over the controversial claims that she had been involved in her second husband’s murder (Lord Darnley). The trial was conducted at York; Mary was not present, nor did she have sight of any evidence that was laid against her. However, the court found neither for, nor against, her. It was, as many commentators have said, nothing more than a ‘show trial’. For further information on the opening times of Bolton Castle, which are seasonal, check out the website here. If you are visiting Bolton Castle, and castles are your thing (of course they are! Who am I kidding? ), nearby are the mighty ruins of two very notable castles; those at Richmond and Middleham (childhood home of Richard III), which you should factor into your visit, particularly if you are staying in the area for 2/3 days. They are in easy reach of each other, so long as you have a car. Also within reach are two extraordinarily beautiful abbeys, both of which were ruined during The Dissolution of the Monasteries: Fountains Abbey (53 mins by car) and Jervaulx Abbey (23 mins by car). The former is one of the most popular National Trust destinations in the country, and illustrates the sheer scale of these medieval institutions. The second, you may well have all to yourself. You have to park up and walk across a field to get to the ruins, which are impossibly romantic. On a hot sunny day, a picnic there, amongst the flower-covered, crumbling walls would be perfect. If you are visiting Jervaulx, then you are close to Snape Castle, which was, of course, the Yorkshire home of Katherine Parr when she was Lady Latimer, during the period encompassing The Pilgrimage of Grace. You cannot access what remains of the castle, but you can see some of its ruined parts and visit the chapel, which would once have been used by Katherine for worship. If walking is your thing, and you love the idea of following in the footsteps of folklore, then you can walk from Leyburn to Bolton Castle, which is around 6.5 miles one way. This walking site gives you some ideas of possible one-way or loop walks that take in ‘The Shawl’. If you wish to learn more about the life of Mary, visit our good friends over at The Tudor Times and read their article about The Life of Mary, Queen of Scots. Hi Hannah, No, I am not questioning paternity. So, for me, strictly speaking, for someone to be a cousin, their parents must be siblings. As you point out, Mary was the grand-daughter of Henry VIII’s sister, Margaret. So not strictly, in my book, a ‘cousin’ but maybe a cousin ‘X’ times removed – twice removed? I am not an expert on labelling the nuances of family trees. Hence I wrote it as I did. I hope makes my thinking clear. Thanks for the question!